When the Pile Light was knocked over in 1949 the signal station was transferred to Bishop Island in about 1952 or 1953. It was only a temporary turnout there, but they still called the station at Bishop Island the Pile Light. The term ‘Pile Light’ was still in everyday use until late into the 1980s when it was finally discontinued because there was no such thing marked on the charts anymore. The signal station was at the northern end of Bishop Island, and nearby were the three signalmen’s houses – the Ford, Tottenham, and Devonshire families. 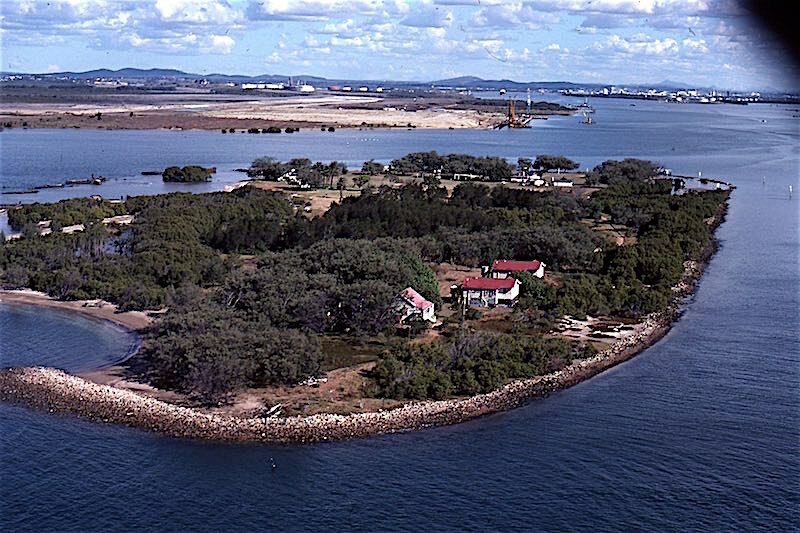 In the course of time, the need to expand the port facilities of Brisbane became apparent, and in 1991 very large reclamation works were begun, causing the demise of Bishop Island, which lost its identity and the name was relegated to that of “obsolete” among official place names. However members of Captain bishop’s family approached the Port authority requesting his memory be perpetuated, and on 16th March 2000 the new bridge linking the port facilities with the mainland, over what was known as the Boat Passage, was officially named “Captain Bishop Bridge” and family members were invited guests at this unveiling ceremony.